The Long Man is a private site located in a beautiful part of Sussex. It also happens to be the easiest venue for me to get to, as it's barely a couple of hours drive from North London. However many Northern flyers don't find it quite so accessible. Any hint of a poor forecast tends to reduce the attendance, so just nineteen pilots turned up on Sunday. The SW bowl presents quite a challenge - it's not very deep, the edge isn't level, and it often gets a lot of turbulence. Fortunately the lift was relatively smooth this time, nevertheless there were still a few prangs: John Bennett damaged his Skorpion due to radio link problems, and Simon Thornton suffered a damaged wing when a wooden post rose up and hit his wing on landing. Times varied between the low forties and the upper fifties. After a lot of rounds (I lost count, but it was around ten!) we had a winner in John Phillips. Simon Thornton was runner-up, with third place going to Mike Evans. 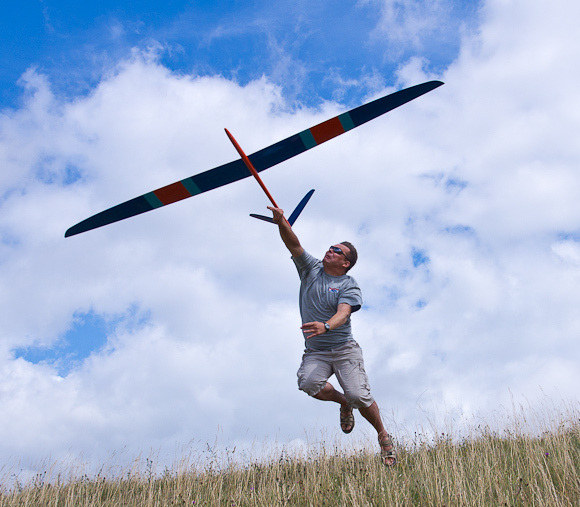 A special mention is in order for Jon Styles who flew his large scale Salto. It didn't win any prizes for speed, but it looked gorgeous in the air, and drew lots of applause. All in all a great day's racing, and lots of fun! My thanks to CD Julian Perrott and all the ESSA crew for all their hard work.